Plants that cause skin tears and trauma injury. Roses are a perennial favourite in the garden and whilst beautiful to look at and often blessed with a lovely scent they do represent a real danger for fragile skin. 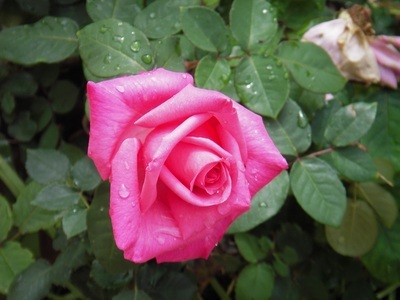 Consider placing Roses away from the path and further back into the garden. A small picket fence around the Rose garden can reduce unwanted entry into the area and consider choosing Roses with no thorns. If using plants with thorns or spikey plants it is wise to ensure they are well away from the path and not in areas of high usage. 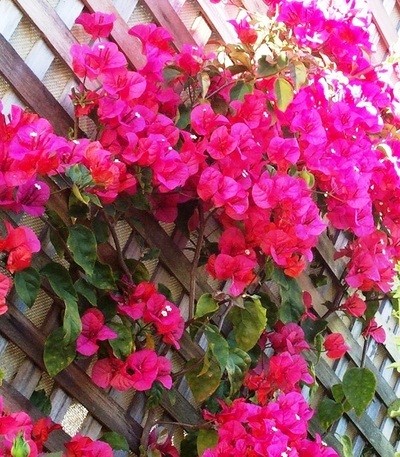 It is possible to use Bougainvillea which grows easily and adds bright colourful splashes to the garden but location is key and consider growing it behind a small trellis fence (approx 1500cm high) with wire support so that Bougainvillea is visible from the top of the fence upwards but out of accidental contact reach. 2. Plants that are poisonous if ingested. Some plants can be poisonous to humans and animals if ingested. It is wise to avoid these plants all together. Some plants it is just the roots that are poisonous so may be considered less of a risk but plants with poisonous leaves such as Poinsettia can pose a very real risk in a dementia garden. 3. Some plants can cause skin irritation and should be avoided in the garden. Stinging nettles are the most obvious but other plants such as Silky Oak and Lantana can also leave a nasty skin rash if brushed against.